...that meets your expectations and beyond. 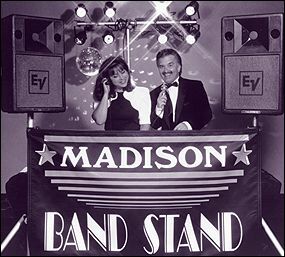 Whether intimate background music, high energy dance or a perfect blend of variety Madison Bandstand can deliver your idea of an exceptional evening of music, fun and dance for everyone. As your Madison Bandstand DJ Nels draws from his personal performance experience and musical background. Beginning in his youth as a drummer in the scout corps, he performed in rock bands throughout his school and college years. Graduating from UW Whitewater in Business and earning a Masters in Counseling and Guidance have given him a unique balance between the music and business worlds.. He offers your event his qualifications to entertain, an overall knowledge of the music business and the enjoyment of his work.